A project looking at the voyage from Cuzco to Machu Picchu. 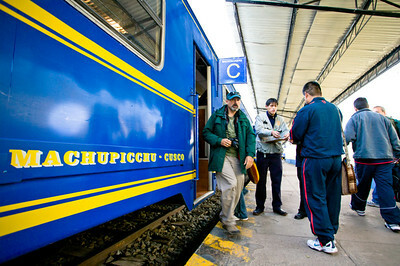 The "Backpacker" train run by PeruRail gets ready to leave San Pedro station in Cuzco for the 4 hour journey to the village of Aguas Calientes, also known as Machu Picchu Pueblo. 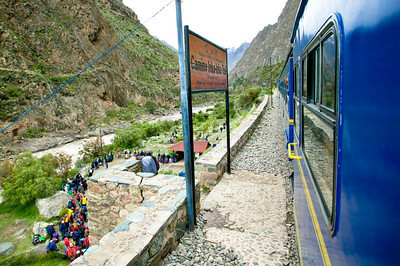 The train from Cuzco to Aguas Calientes is the fastest and only way to get to Machu Picchu for tourists. 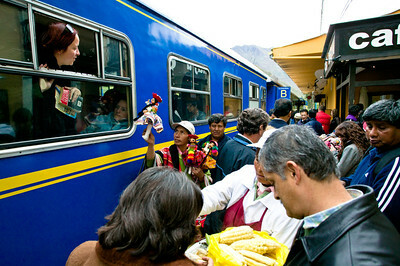 PeruRail currently has a monopoly on service to Aguas Calientes. 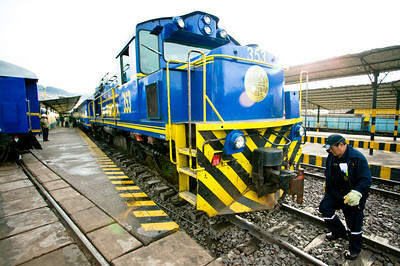 The four hour, 80 kilometer ride costs 72 dollars round-trip for the cheapest "backpacker" train and about 107 dollars for the more comfortable "Vistadome" train. 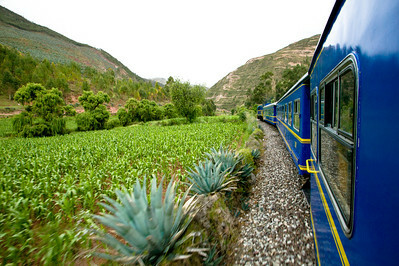 The Hiram Bingham luxury train is also available for a mere 588 dollars. 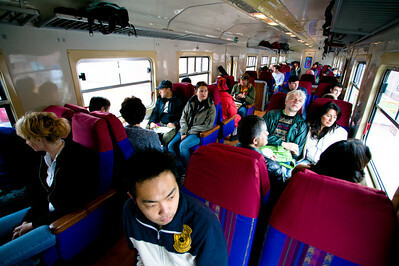 The train becomes a melting pot of mostly East Asian, European and North American passengers. I sat next to Daisuke, a 28 year old chemical engineer from Osaka, Japan traveling for the first time in Peru. 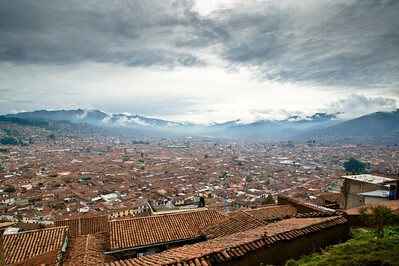 A departing view of Cuzco. 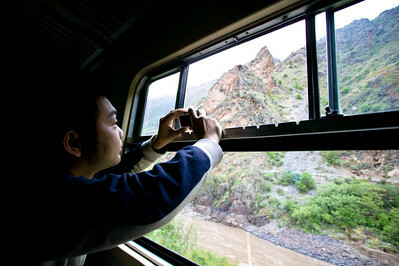 In order to leave Cuzco the train slowly climbs, stops, and reverses direction to change tracks. It does this a half dozen times over a 30 minute period to get over the steep hill. 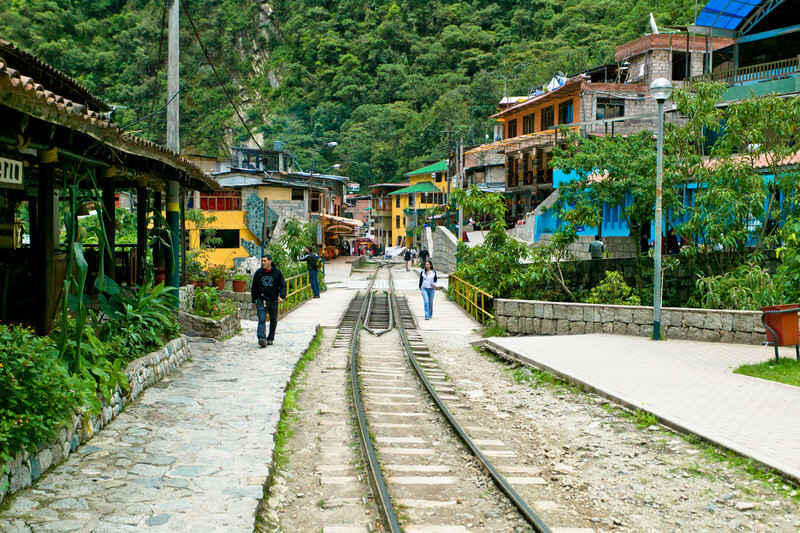 The train winds its way towards Aguas Calientes through farmland, pastures, valleys and mountains. 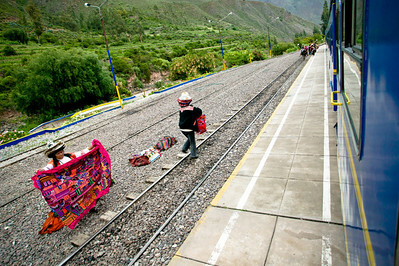 Locals sell alpaca tourist products and food to passengers on the train at Ollantaytambo, one of the few stops along the way. Kilometer 82...the start of the Inca Trail. The numbers who can hike the trail are limited forcing visitors book the 3 to 4 day hike months in advance to secure their place. Trash, temporary toilets and erosion are becoming problems along the trail, forcing the government to limit the number of trekkers and shut down a portion of the trail every February for repairs. 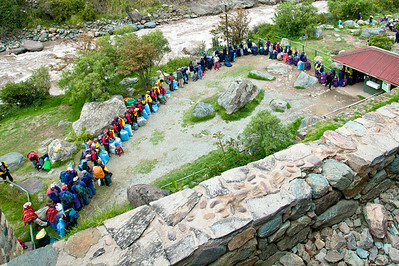 Trekkers line up to start the trek. Due to overuse leading to problems with trash, makeshift toilets and erosion, the government has introduced heavier restrictions in order to protect the trail, requiring licensed guides and limiting the number of people to 500 (including porters and guides) that can begin the trail each day. The Inca Trail is big business employing about 5,000 porters in the high season, mostly subsistence farmers from the valley. They carry up to 25 kg of tents, food, gas bottles and cooking equipment. 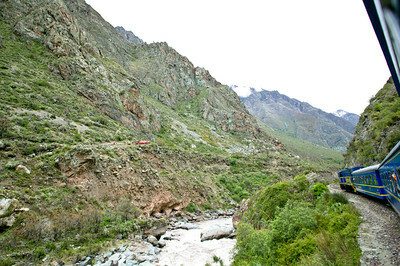 Porters must hike ahead of the group (red in the photo) in order to set up camp and prepare dinner before the trekkers arrive. 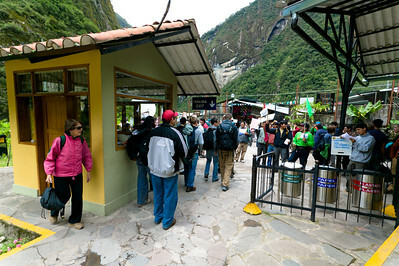 Passengers arrive at the last stop on the line, Aguas Calientes or Machu Picchu Pueblo station. As passengers leave the station they are hounded by hostels and hotels looking to fill rooms. Tourism makes the world go round in this small town only 6 km from Machu Picchu and competition for tourist dollars is fierce. 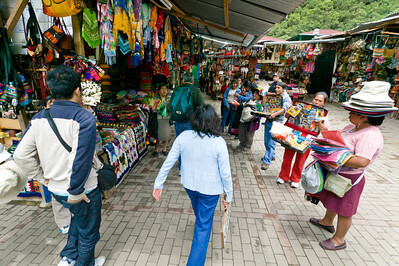 In order to exit the train station passengers must navigate through a dizzying labyrinth of handicraft tourist stalls. 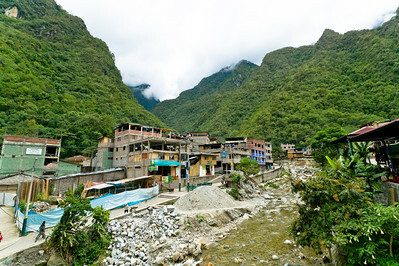 Aguas Calientes isn't exactly a beautiful town. Uncontrolled and rapid growth has produced a village in constant construction. Although there are plenty of rooms to fit any budget in town and easy to find once you arrive, it's best to to book ahead and have a place waiting for you. I found a private room with bath in a very clean and new hostal for 20 dollars a night including breakfast. 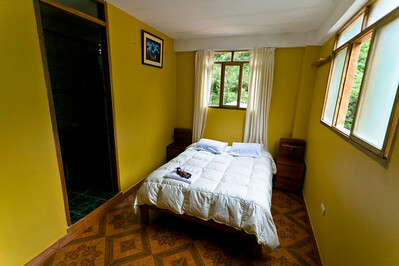 Dorm rooms go for as cheap as 8 dollars a night and rooms at El Sanctuario Lodge, a 5 star hotel at the doorstep of Machu Picchu, start at 700 dollars a night. 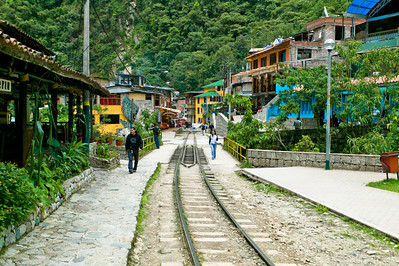 Aguas Calientes is the end of the train line. 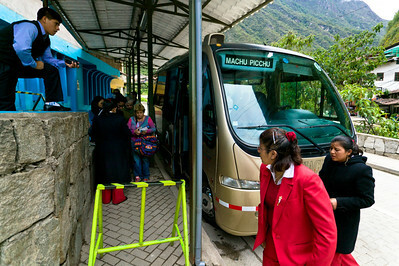 The most conventional way of getting up to the entrance of Machu Picchu is by bus (and the only way for the time being, save for hiking up). The bus service going up the dozen switchbacks carved into the landslide-prone 3 mile dirt road will set you back 14 dollars round trip and takes 30 minutes. Take the first bus at 5:30 a.m. to avoid the crowds and see the ruins in their best light. 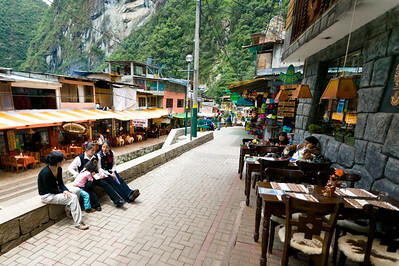 Waitresses wait for tourists outside a restaurant in Aguas Calientes. Restaurants will do just about anything to get tourists inside. 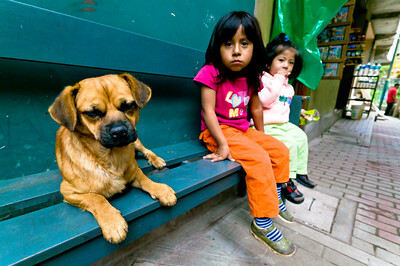 It's impossible to walk down the street without hearing "Amigo, come inside. Eat lunch. Pizza, pisco sour...good price!" 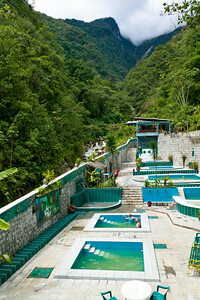 The natural hot spring which gives Aguas Calientes ("Hot Waters") its name is a good 10 minute hike north of town (3 dollar entry fee). Forgot your swimsuit? No problem, many shops will happily rent you one and a towel at the entrance for a few dollars. There is also a bar that serves beer and all types of mixed drinks, bringing them right to you in the water. 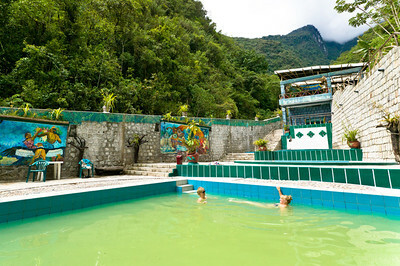 Perhaps not as hot or as clean as some would like, the natural springs are still a great way to end your Machu Picchu adventure. Beware however, the peacefulness starts to fade after 4 p.m. when the tour groups and sweaty trekkers start pouring in (open from 5 a.m. to 8 p.m.). Locals relax on a bench and watch the hordes of tourists come and go on a daily basis. A short 25 min. 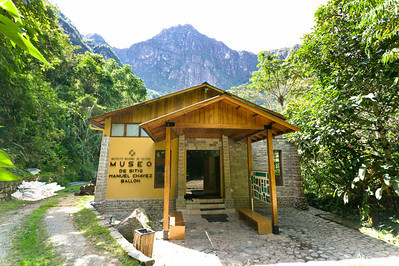 walk out of town towards Machu Picchu is the "Machu Picchu Museum." If you are looking for a more in-depth understanding of the ruins and are up for a relaxing walk, the museum is open from 9 a.m.–4:30p.m. daily for a slightly overpriced $6.50 USD . Have more energy than money? 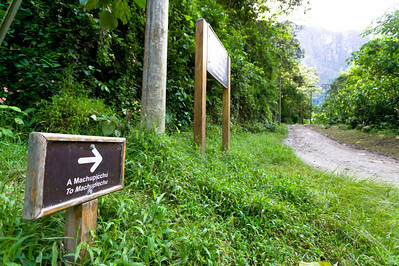 Hiking up is an option and will take about one hour and a half depending on how in-shape and acclimated to the altitude you are (Machu Picchu is at roughly 8,000 ft). 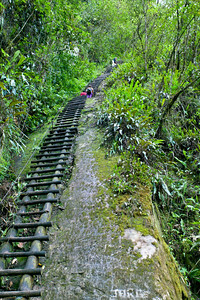 A wooden ladder on the Putucusi trial leading up Putucusi mountain. If you have the guts, energy and time, the 2 hour hike up this lesser traveled trail just outside of town is well worth the effort, rewarding visitors with a spectacular view of Machu Picchu.